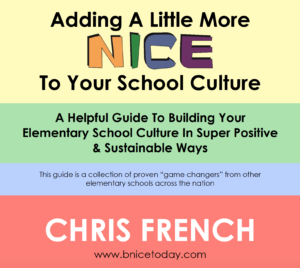 BNICE with Chris French offers sustainability in a number of ways. One of which is by way of guides and lesson plans that can aid the classroom. In the links below, feel free to download the discussion tools "How to BNICE" and / or the "Elementary BNICE University" tools focused on 4 pillars of character. 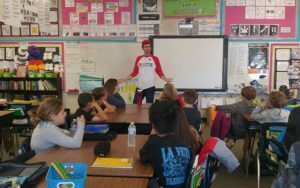 The key in these materials is to get the kids openly discussing and thinking critically about character and what it means to them. Sometimes people say that being nice is often easier said than done. The whole point of the BNICE Initiative is to make it as easily done, as easily said. It’s a personal commitment to be more morally aware. The BNICE Initiative is for all ages. This guide isn’t meant to be read from cover to cover in sequential order. You can pick a phrase or topic and simply go from there. Just a little bit as often as you can think of it, is more than enough. It revolves around Random Acts In Niceness (RAIN) that you can do with Anyone, Anywhere and at Anytime. Click the picture to view and download. 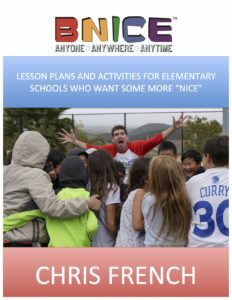 These elementary school BNICE lesson plans are meant to act as a guide to empower and inspire teachers to strengthen the moral awareness of the classroom. 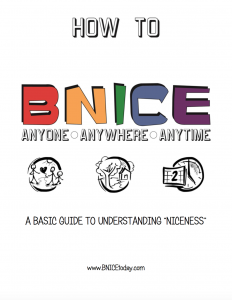 These are a great alternative to the "How to BNICE Guide" for teachers who want a little bit more detail. Here's some mini lesson plans for you as well. changes that you and everybody can be proud of.